The weather here can change very quickly, be prepared for anything. Many have made the mistake of thinking the weather will stay the same for the evening, we can experience all four seasons over a couple of hours 🙂 the good news about that is the fact that even if it does not look to good “right now” the conditions could be perfect in a few minutes so it pays to keep an eye on the forecasts. Put on some more layers then you would normally in the same conditions, while photographing you are not moving around much so the cold can get to you much faster then if you were going on a hike for example, most instances you are not going to move far from the car to set up and start shooting. The windchill is a big factor once you leave the city, it can get much, much colder then what the temperature meter says it is. Bring a headlamp, flashlight and extra batteries. Many would recommend a bunch of different lights, filters for the lights and what not. 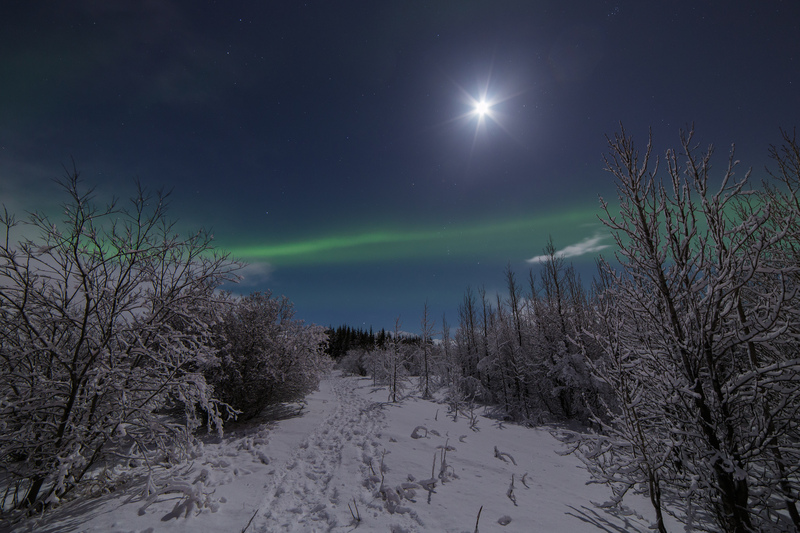 Of course that is better but in my opinion not necessary, I have a good led headlamp, with a high/low setting and a high quality flashlight in my pocket, plus the light on my mobile phone and that is more then enough for me so far in all my northern lights photography trips. What camera gear to bring? When I wrote this guide most of my photos were taken on a Canon EOS 6D body and a Samyang/Rokinon 14mm f2.8 lens, today I have upgraded lenses and camera bodies but the guide still applies the same today. That combo is perfect for me and not to expensive, most of the pictures in my galleries are taken on that combo but here is an example were I took the f-stop to f7.1, a big no no if you take most guides word for word but I wanted everything in focus and to get some star burst effects as well so I experimented with that and was happy with the results, so don’t be afraid to try different things while out there – I will how ever give you a basic recipe to start with and from there you can adjust and play around with the settings. 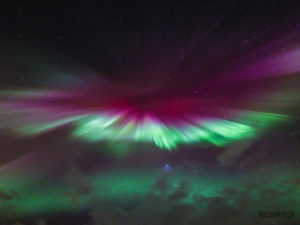 It’s worth noticing that you need strong auroras to catch them on such a small aperture. getting some auroa in there as well. Use RAW mode for photos if possible, if you are not familiar with raw then try to use raw+jpg if you can, the raw file is a lot better to use later on in post processing. Switch the lens to manual focus and turn of image stabilization if there is a setting for that. Use a remote shutter so you do not have to touch the camera to take the shot, if you don’t have one that’s OK, just set the timer on the camera to a few seconds so its steady when the shot is taken. Make sure the tripod is as sturdy as possible, hang your camera bag or something on it to make it more steady if you can and if it has a center column then try to have it as low as possible since on most tripods it is the weakest link stability wise. I like to remove the camera strap from my camera while doing long exposure to make it more steady if there is a small wind, but its up to you if you want to do that or not. Use live view to focus on something far away like a star, or if that is not possible then focus all the way to infinity and then just a tiny bit back, then take a photo and view it zoomed in afterwards to see if the focus is right then adjust accordingly. Now you are ready to start shooting, next step for you after you get on location is to do some test shots. You will quickly see if you need to adjust the time and iso, likely the photo will be over exposed and you need to take down the time and iso. 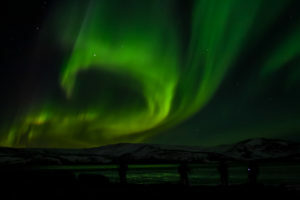 But at the same time you can use those settings to see if there is something starting, because the camera will sometimes see the aurora before you and if you see a faint line somewhere then you have time to set up pointing in that direction and get ready for a bigger show. In case there is already a lot of activity once you arrive then I suggest starting at 400 iso for 4 second and adjust from there. In extremely strong activity you might need to go as low as 1/60 seconds exposure. Those are the basic settings you need to start photographing the Northern Lights, I won’t go into details on white balance and more advanced settings but if you want to change that then I recommend setting the custom white balance to K4400, that is normally very close to being right and then its easy to correct if needed in post processing. Þingvellir, one of Icelands national parks. and a 6.3 second exposure. this shot is aimed straight into the eye. Here are links to important tools and a brief explanation on what to look for when planning to photograph the aurora borealis. I normally have most of those sites open in tabs on my mobile phone while out hunting and check regularly over the evening. First I will give you the link and key note information on what to check on each site, under the link you can read a more detailed explanation. I check this site daily during the season but only briefly. 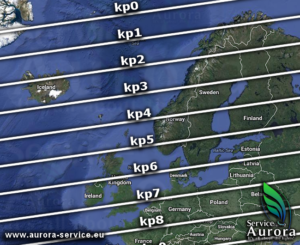 They monitor the conditions in the space around us closely and often you can get a good aurora forecast up to 3 days a head. So be sure to scroll through their page and see what’s going on. When you have time you should take time and explore the information on that site, it’s very informative. Here we have a very dedicated team of aurora hunters in Finland. 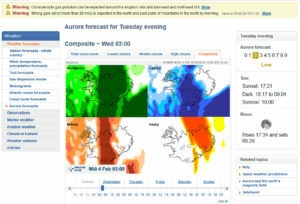 However they have a short term aurora forecast that is normally pretty close to what we see and good to follow. The part I like the most is the solar wind gauges where they show what Nasa is measuring right now. It’s very useful and you can read in detail how it works on their web site but basically what you should look for is the Bz number. But it can jump up and down so we don’t give up even if its on the plus side when we check. The other two gauges are pretty self explanatory, Speed km/s is the speed of the solar win headed to earth, the higher the number the more lively the show can get. And last Density cm3, the higher that number gets the better for us. On the Image you see a map with Kp index lines, on their website you see a live version of that map that gives you an idea of the activity. 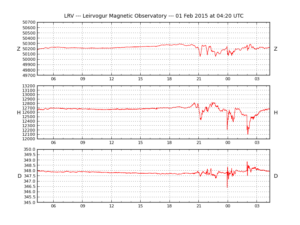 Here we have real time measurements of the geomagnetic field over Iceland measured from Leirvogur in Iceland. This is in my opinion the most accurate information on what is happening right now over us. If I’m sitting in front of the tv and happen to see a big dip on the Z scale then my heart starts racing, if the cloud forecast is on my side as well then I’m out in minutes! Things can happen really fast, I have made the mistake of seeing a very big spike, gathering my gear and watching epic northern lights dancing over my home on the way to the car. And after rushing to drive to a darker location only to have no activity once there, I would have been much better off grabbing the opportunity right at home! Back then I thought you had to go to total darkness to get some decent shots but these days I’m more excited about photographing buildings or other things around the city in the foreground. And with the right technique you can have just about anything in the photo with the aurora dancing in the background. Next I will put three different links to check local weather, cloud cover and road conditions. 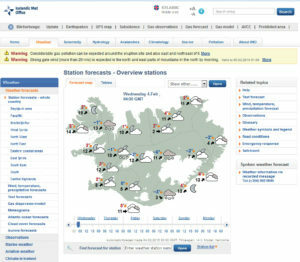 On this page you can see how the weather is and use the slider at the bottom of the map to see the forecast for the next hours. You can select any part of the country for a more detailed view but you get a good idea about the weather on the overview. Be sure to check the text forecast below the image as well, if there are any warnings from the Icelandic Met Office the will be displayed there or in bold above the image. Also the text forecast is always both more accurate and informative. 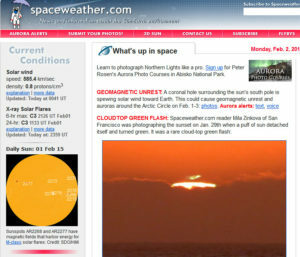 While not the most accurate aurora forecast around, the cloud forecast is usually pretty accurate. Make sure you check lower, middle and high clouds separately. It might look like there is complete overcast on the combined photo but that might mean there are almost no clouds except some low ones for example. This is the website for the Icelandic Road and Coastal Administration. It will show you the conditions in all of Iceland but since I want you to have a safe journey I’m only linking to a map of South-West Iceland. I recommend not going much further then 50 km in any direction from Reykjavik during winter and before you head out be very sure about road conditions and the weather. I have seen countless rental cars off the road where either the car or the driver was not ready for the extreme conditions we experience in Iceland. 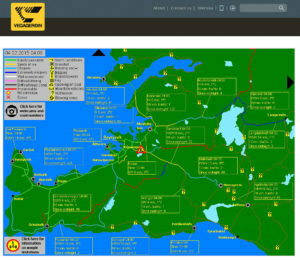 When you look at the map you will see different colors and also boxes with information. The colors show road conditions and are all explained in the box top left on the site. 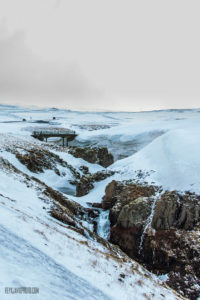 Click here to open my Contact form and send me a message, I am happy to help with anything from questions you might have while planing your trip to Iceland,to assisting you to book a photo tour.